Paid Search Vs. Organic Search: Which is Better? Is it better to use paid search (PPC) versus organic search marketing? Sounds like a simple question, but the answer is much more complex. Both methods have specific benefits and drawbacks. Let's discuss some major differences and consider the best approach. According to ComScore, search engine users conducted 18.6 billion explicit core searches in April 2014. That number excluded searches without specific intent to interact with the search results. The search engine result pages (SERPs) likely provided a mix of both organic and paid rankings. Both organic and paid (PPC) have distinct advantages and drawbacks. Knowing them will allow you to get the best return for your search marketing dollars. As you will see, combining them will often result in a better click through rate (CTR). Organic Search: Organic search results are the listings of Web pages returned by the search engine’s algorithms that closely match the search string of keywords. Marketers use SEO and content assets to get high search engine rankings. 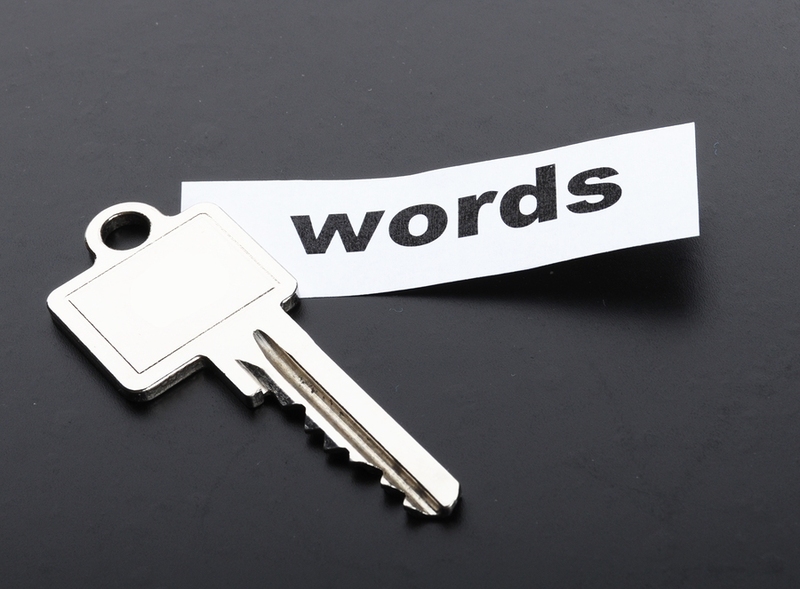 The goal is to be on the first page and then move into the top three rankings for specific keywords. That’s because the advantages of organic search are dependent on visibility. The higher the ranking the more pronounced the advantages. They all but disappear if your listing is not on the first page. Trust and credibility: With high search engine rankings comes a perception of credibility on the part of searchers. High search rankings imply industry authority and leadership. This perception translates into more trust and a greater likelihood to click through to the site. Evergreen: If the content that ranks high is evergreen, then the rankings will also have a more evergreen presence. The specific listing may rank high long after the content was created. Ranking: Once you get high rankings, it’s easier to keep those rankings. You get authority status and build the trust of users and search engines. Click through rates: For “top of funnel” search terms, I.e., don’t show immediate purchase intent, the click through rates are better for organic search results. That’s very important for businesses that have a longer buying cycle. Inbound marketing: An organic search strategy requires marketers to develop the content assets to achieve it. This is important for higher involvement purchases. Users interact with content as they move down the purchase funnel. Time: Depending on the competitiveness of the keywords involved, it may take months or years to get high rankings. Can you wait that long? Resources: Getting high rankings requires both creating content and using SEO tactics to achieve it. That can be difficult, frustrating and time consuming. Either internal staff or external contractors are needed for both these functions. Paid Search (PPC): Paid search results are advertisements. A business pays to have their ads displayed when users do a search containing specific keywords. 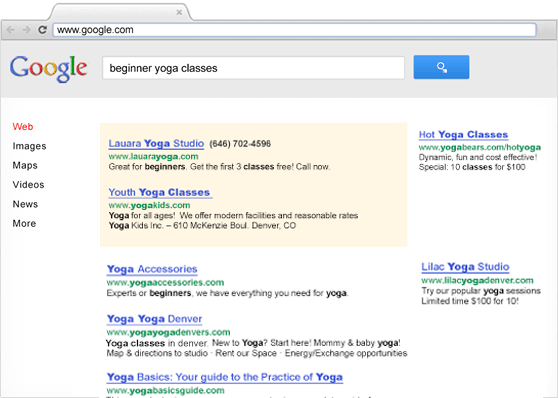 The ads are typically displayed above and to the right of organic search results. The exact placement of the ads is determined by both a bidding process and quality score. The advantages and drawbacks of paid search are often the opposite of organic listings. Time: Unlike organic search rankings that can take months or years, paid results are placed at the top of rankings as soon as you pay for ad placement. Targeting: PPC campaigns can be tailored to reach specific audiences. Examples of segmentation include geo-targeting, income, age, educational level, marital status, industry, etc. Click through rates: Searches using terms that denote high purchase intent such as product or brand-specific keywords will get more clicks than organic results. The advantage of paid search can clearly be seen in the Internet retailers MarketLive Performance Index data. For the year 2013 as a whole, PPC accounted for 36.5% of search traffic but an outsized 47.9% of revenue from search. Cost: The more competitive the keyword, the more the bid price is for each click on the displayed ad. Paid search requires a level of expertise to manage these campaigns. Otherwise a lot of money will be spent to attract unqualified traffic. Momentary: The ads disappear as soon as you stop paying for them. Distrust: Consumers don’t always trust paid ads and often avoid them. They place more trust in organic rankings. Click through rate: Except for high purchase intent searches, users will click on paid search listings at a lower rate than organic search listings. Organic listings have more credibility with search engine users. In one UK study, published by Econsultancy, only 6% of clicks were the result of paid listings. In another study, it was 10%. The important thing to remember is that click through rate varies by purchase intent. Organic rankings will get more click through rates for “top of funnel” keyword search queries. Together is better! For many businesses, the best approach is a mix of both organic and paid search results. The advantage of this approach is that organic rankings give a business credibility and evergreen search results. Paid search (PPC) provides immediate top-of-the-page listings and greater click through rates, i.e., sales, when consumers are ready to purchase. According to a Google study, paid search ads with an accompanying organic search result only occur 19% of the time, on average. Nine percent of the time a search ad shows with an organic ad in the top rank. What is surprising to many of us is the growth in incremental clicks when they appear together. Even the first organic ranking can benefit from an accompanying ad. Google’s results showed that 50% of ad clicks did not replace the clicks on the first organic search listing when the ads didn’t appear. 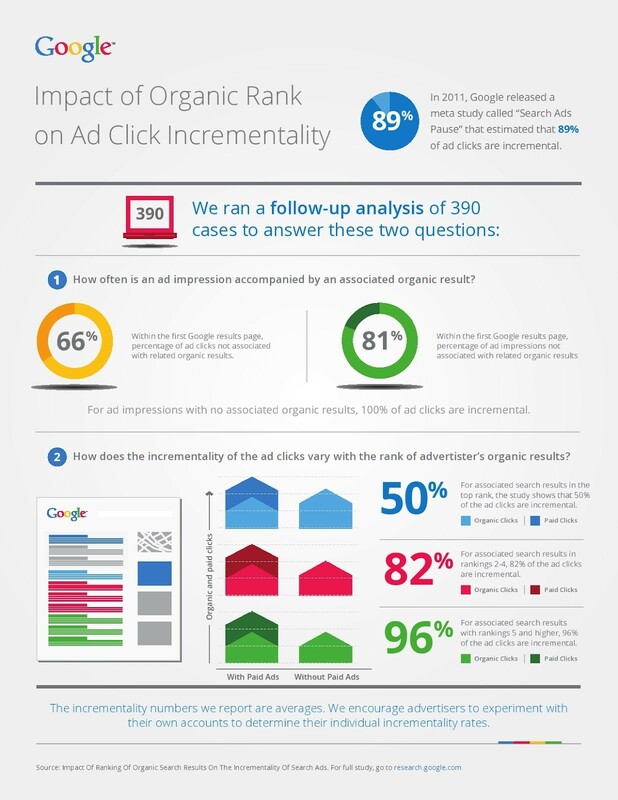 The study found that 82% of ad clicks are incremental when the associated organic result is ranked between 2 and 4, and 96% of clicks are incremental when the brand’s organic result was 5 or below. So, should you use paid search or organic search for your marketing? It depends. It depends on your marketing needs. It depends on which method gives you the best CTR or ROI. Whether paid or organic search is better depends on purchase intent displayed by the search query. What we do know is that "together is better."